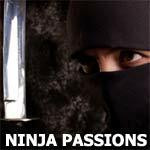 True Path of the Ninja is the first authoritative translation in English of the Shoninki—the famous 17th century ninja training manual. The Shoninki, one of the most important of these coded manuals, was written in 1681 by Master Ninja Natori Masazumi. Nonetheless, human thinking is still deeply rooted in the cosmology of the middle ages. This is the book to change your way of perceiving yourself -- and the universe. Way Of The Ninja is a Kodansha International publication.